The Bears have a new project: Pets! Over the next few weeks they will have lots of visitors to the class. The first special visitor was Lola the cat. She came to meet them and they learnt lots about how she moves, the sounds she makes and how she feels. To finish Cat Week, they did a bit of face painting. 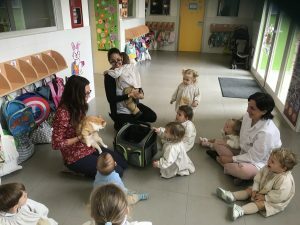 They had a very good time while they learnt about Cats. https://www.cumbresschool.es/wp-content/uploads/2018/05/tuu.jpg 2397 3481 Gestor DIRCOM /wp-content/uploads/2017/05/valencia-1.png Gestor DIRCOM2018-05-16 12:44:512018-05-17 11:48:33Pets!